The all-male residential fraternity Psi Upsilon has been placed on probationary housing status and suspended from all social activities through the end of 2015, according to an all-campus email today from President Roth and Vice President for Student Affairs Michael Whaley. 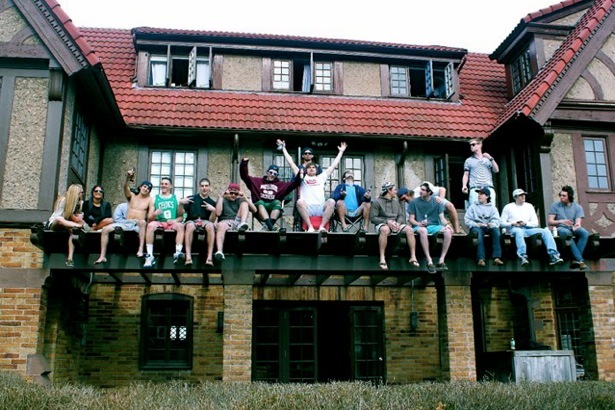 Although the email acknowledges that many or all of the current fraternity members were not present at the time of either assault, the University believes that “some sanction of the fraternity is appropriate,” and the resulting decision is “consistent with our policies to support survivors, punish assailants and change the culture so as to eliminate elements that lead to sexual assault.” This action follows a busy semester of changes to and increased oversight of Greek life on campus, including the announcement that the Beta Theta Pi house would be off-limits to students for the 2014-2015 academic year. The entirety of the email has been reproduced below. Posted by Gabe on December 1, 2014 at 5:41 PM. In an all campus email today, it was announced that Beta Theta Pi will be off limits to students for the full academic year starting on Monday, September 15. The administration’s decision was certainly amplified by this past weekend’s incident, in which a student was seriously injured after falling from a third story window. Along with this occurrence, Beta has been in the news in recent years for incidents of sexual assault. This is a definitive step for the administration, which has spent years refining housing policies to have more control over residential fraternities, in particular Beta Theta Pi. The students who currently live in Beta will be given alternative university housing for the year. While the residence will be off limits for at least the full year, a final decision on the permanence of this resolution will be made by the Board of Trustees when they are on campus in two weeks. Updated (9/15/14 5:29 PM): Beta is officially off limits to students for the year, starting today. An all-campus email today stated that any student found on the Beta property without permission from both the University and the alumni association that owns the house will be “charged with violating the Code of Non-Academic Conduct and sanctioned accordingly, up to and including immediate suspension. Students may also be subject to trespassing charges via Middletown Police, at the owners’ discretion.” The e-mail is reproduced below. Posted by Samira on September 10, 2014 at 12:21 PM. The contents of the following article contain offensive, derogatory language, and material that may be triggering for survivors of sexual assault. The names and some of the details in this article have been changed for privacy and legal concerns (but more about that last bit later). Written in bold black sharpie, the phrase “She said stop, I said Hammer Time,” was one of the first things that Dan and I saw on move-in day. I was helping him load his things into the room he was renting at Wesleyan University’s Beta Theta Pi fraternity, where we both lived last summer, as tenants. This was not the only message left for Dan—writing covered almost every square foot of wall. I had just moved into my own room earlier that sweltering afternoon in May, and I was already growing slightly unimpressed with the misogyny. I would be lying if I didn’t say that over the summer that I lived in Beta, the impact of the graffiti grew smaller and smaller, till it felt the way bathroom obscenity feels. Still, on move in day the abrasion wasn’t calloused over yet. First, however, a few words on how I ended up living in Beta. I had originally planned on living in official universities dorms for the summer research session. Then I got an email saying that Beta would be offering housing for a third of the price: only $300 a month. In addition to cheapness, there was the benefit that the house was big enough for nearly all my friends who were staying on for the summer. The house had a yard equipped with a charcoal grill, a huge living room where we could hold open mics, parties, etc, and a refrigerator big enough for twelve 30 racks of Miller—not to even mention the king-sized beer pong table. On top of it all, I had leased early enough to get my pick of the rooms. I ended up in the Beta president’s suite. Posted by Wesleying on April 29, 2014 at 12:00 PM. 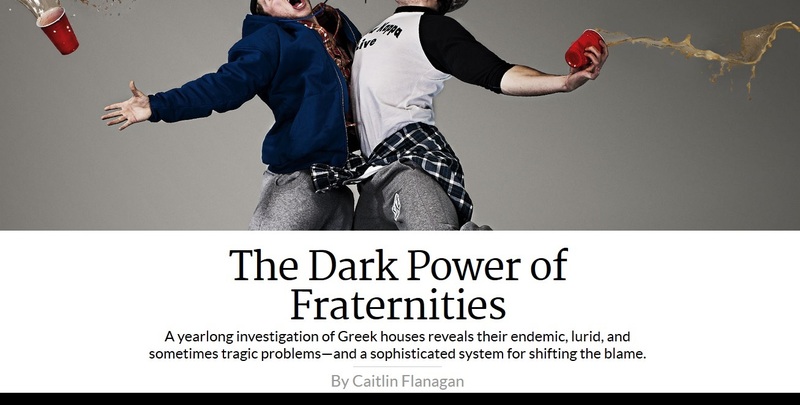 “The Dark Powers of Fraternities” was published this morning by The Atlantic. 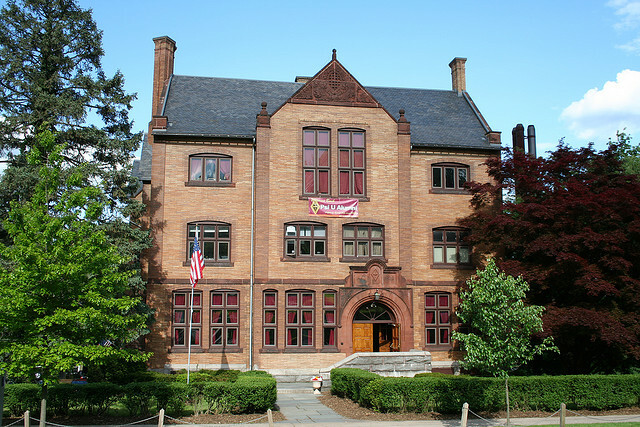 The article is the culmination of a yearlong investigation into the systemic power of fraternities and the tragedies derived therein, and prominently (ignominiously) features our very own Wesleyan University and Beta Theta Pi. In brief, the article describes fraternity organizations’ thoroughly American heritage, their roles in transforming the nature of higher education from the priest-factories of yesteryear into the often-outrageous party scenes of the modern day, and the complex trade-lanes of power, litigation, fundraising, and tragedy that have allowed the fraternity infrastructures to survive and thrive among even the most progressive of Universities. The article gets many, many things right, and I thoroughly agree with the sentiment of the author—that colleges and universities are institutionally and structurally threatened by powerful organizations with outdated (and morally detestable) principles and priorities. The article also gets a few minor points wrong, and misses a larger point: the cultural attitudes we—as Wesleyan students, as American collegians, literally as humans—accept and collectively promote bears as much responsibility for the horrors described as do unscrupulous power structures protecting that culture. In other words, I am responsible for the continuation of awful events like those brought to light in “The Dark Powers of Fraternities,” and so are you. Posted by pyrotechnics on February 20, 2014 at 3:30 PM. The brothers of Beta Theta Pi cordially invite all Wesleyan students to participate in a discussion about responsible drinking practices. Beta Theta Pi junior Bobby Cunningham has spent this semester putting together an extensive presentation regarding safe drinking habits. He will lead the discussion, focusing on what we can do as individuals as well as a community to encourage and promote sensible alcohol consumption and avoid the consequences of excessive drinking. Please stop by 184 High Street at 9:15 pm TODAY to find out what you can do to not only better yourself but also improve social responsibility amongst the Wesleyan community. This will be a great opportunity to focus and reflect on responsible vs. irresponsible drinking, learn about the dangers of excessive alcohol consumption, and adopt smarter, safer drinking habits. There will be fun facts and non sequiturs galore. We look forward to seeing all of you on Wednesday night. Posted by Maya on December 4, 2013 at 12:30 PM. Last October, a former student (under the pseudonym of “Jane Doe”) filed a federal lawsuit against Beta Theta Pi fraternity, the Baird Association (which owns Beta’s house), and Wesleyan University. The lawsuit alleged that Wesleyan had failed to abide by Title IX law through failure to “warn or otherwise take corrective action” against the fraternity that could have prevented the assault on the student that occurred in Beta two years prior. The case accumulated significant attention in national media (as well as, uh, me), especially when it came to light that lawyers for Beta were attempting to force the survivor to reveal her identity. Posted by pyrotechnics on September 10, 2013 at 7:30 PM. 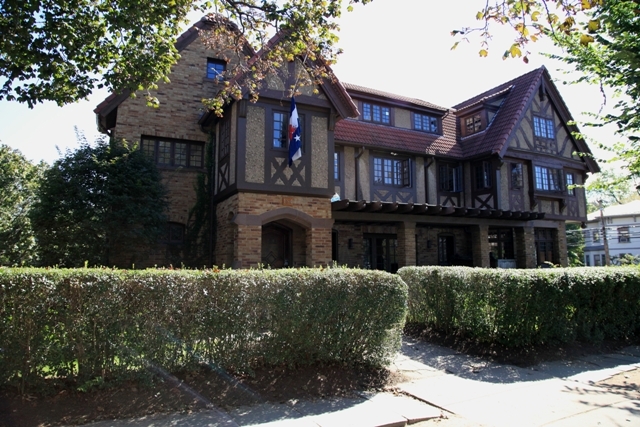 The members of Beta Theta Pi share the campus’ outrage at the allegation of physical assault and attempted sexual assault at our chapter house early Sunday morning. We are cooperating with the University and the Middletown Police Department as they seek to identify the alleged attacker, and will continue to help the authorities in every way if and when he is found and arrested. Events such as this compromise the sense of safety and security that we as members of a campus community deserve, and we have zero tolerance for such actions. Unfortunately, sexual assault at Wesleyan remains a problem, and we share the belief that sexual assault, like any kind of assault, is always problematic and utterly unacceptable. That our house became the location of this unfortunate and intolerable crime is a powerful reminder to the entire Wesleyan community that we collectively need to do a better job at raising awareness and prevention of these types of events. Beta Theta Pi plans to strengthen our partnership with Wesleyan’s Sexual Assault Response Team (SART) and Counseling and Psychological Services (CAPS) and we will continue to plan programs for our members such as last semester’s WESpeak-WEStand Bystander Intervention program, which aimed to create a campus culture that is actively engaged in the prevention of sexual assault. We all need to do our part in creating the safer community we deserve, and the incident early Sunday Morning makes it self-evident that we need to do better. Our thoughts, prayers, and solidarity are with the survivor. We encourage anyone with any information about the incident to call Public Safety at 860-685-2345 or the Middletown Police at 860-344-3200. Posted by pyrotechnics on April 8, 2013 at 3:33 PM. Join us for our first rush event! Beta Theta Pi, Mu Epsilon Chapter, will be holding a barbecue at our house, located at 184 High St. (corner of Church St and High St). This is an open event, designed to give current brothers and prospective brothers a chance to meet one another. Please feel free to spread the word to other guys you think may be interested. The barbecue, being the first rush event, is an excellent opportunity not only to meet everyone involved, but also an opportunity to see the house. It’s a relaxed and fun event, no pressure whatsoever. The barbecue starts at around 6 and goes until around 7:30, so even if you can’t make the whole thing, stopping by even for just a few minutes is still a great way to get a preliminary feel for everything. Any questions can be directed to Nate Howell ’14 (NHowell@wes), Matt Gross ’15 (MBGross@wes), Rex Bernstein ’15 (RBernstein@wes) or Nate Ryan ’15 (NJRyan@wes). We look forward to seeing you soon! Posted by Zach on September 14, 2012 at 3:43 PM. Posted by crash on February 14, 2011 at 1:28 PM. The Eclectic Society and Beta Theta Pi have long concealed a torrid love affair, rife with jealousy, lust, secrecy, violence, and, most significantly, passion. The grand houses of high street stood side-by-side, day and night, feigning mere acquaintance while pining desperately to make known their true intimacy. 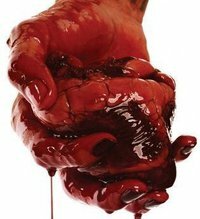 Alas, the Society and the Fraternity can take no more of the agonizing secrecy, and just before Valentine’s day, invite you to join them in celebrating their newly visible relationship. Also performing will be Wesleyan dance-party mainstays L31F, Harrison Schaaf, and SLY1Z. Also look out for a very, very special secret guest from out of town (pending). Posted by S*J*K on February 8, 2011 at 2:10 PM.